"Daily payments were preferred over lump sums to pay for residential aged care accommodation in 2016-17, the first time since the 2014 reforms, the sixth Aged Care Financing Authority report shows." Federal Regulation for Retirement Villages ? The residents of Alexandra in Victoria have reached an agreement with Bishop John Parkes to purchase the aged care bed licences and take full control of the local aged care facility from the Anglican Diocese of Wangaratta. 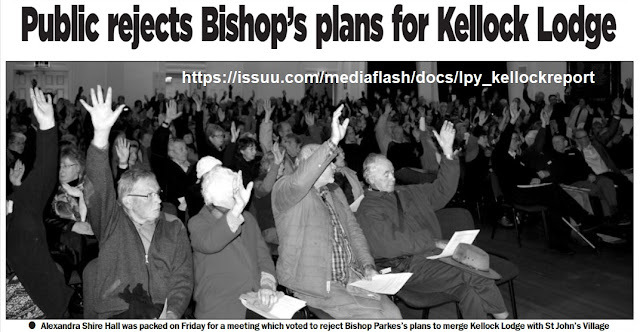 Alexandra businessman Larry Fallon brokered the deal with Bishop Parkes after the initial actions of Bishop Parkes divided the community. The deal sees Kellock Lodged paying $3.5m dollars for 50 aged care bed licences with the building and land being transferred into a new entity to be formed locally in Alexandra.